This is a tour aimed at English-speaking adults with an interest in the Cathars. 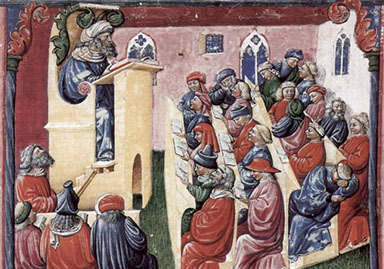 No prior knowledge is assumed, though in practice most people who attend these tours will have read one or more popular books on the Cathars and the Albigensian Crusade. September 2019: 9 am, Sunday 15 September  5 pm, Saturday 21September. June 2020: 9 am, Sunday 21 June  5 pm, Saturday 27 June. September 2020: 9 am, Sunday 6 September  5 pm, Saturday 12 September. Group Size. Groups sizes are variable but seven is typical. 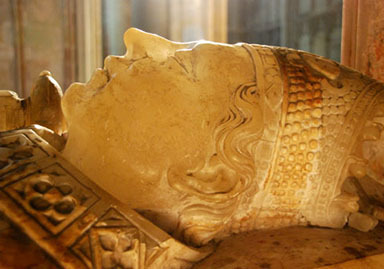 Included is information on related topics such as techniques of medieval warfare, castle architecture, heraldry, feudalism, the role of the Catholic Church, the Count of Toulouse, Occitan culture, medieval politics, and source documents. Day 1  Toulouse / Lastours. We visit the ancient city of Toulouse. 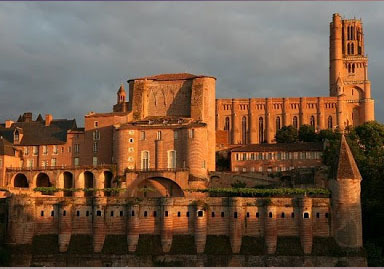 Here you will discover Toulouse's beautiful centre, learn about the Cathars and the medieval Counts of Toulouse. Lunch will be at a favourite restaurant in the center of Toulouse. In the afternoon we visit the four towers of Lastours, three of which date from Cathar times. Lastours became the nucleus of opposition to the Crusaders in the thirteenth century. Day 2  Fontfroide / Villerouge-Termenès We head Northeast towards Fontfroide. 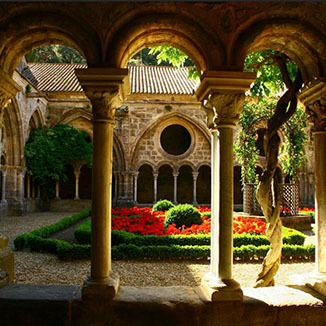 Fontfroide is a beautifully restored Cistercian abbey which played an important role in many of the events associated with the Albigensian Crusade. Lunch is at the abbey restaurant. In the afternoon we will visit the castle of Villerouge, once a residence of the Archbishops of Narbonne, where the last known Cathar Parfait was burned at the stake. Day 3  Rennes-le-Château / Wine tour. Rennes-le-Château was a Roman city (Rhedae) and later a Visigothic capital. It lies at the heart of a series of Languedoc mysteries which have attracted huge international attention in recent years. We visit the famous church and presbytery here and discuss the various mysteries associated with the village (including Cathar beliefs concerning Mary Magdalene and supposed links with the Knights Templar). Lunch in Rennes-le-Château followed by a wine tour in the afternoon. Day 4 Montségur & Puivert. In the morning we drive into the Ariege and climb to the iconic Castle of Montségur where over 200 Cathars were burned alive in 1244 after a ten month siege. We also visit the museum (time permitting) and have lunch in the village of Montsegur. The afternoon is spent at the Château at Puivert, known for its troubadour history, where a famous canso was composed, possibly for Eleanor of Aquitaine. We will also discuss the Occitan language, the origin of Romance and Romantic Love, and the origin of the troubadour tradition. Day 5  Free day / Carcassonne. A free day is provided. You can enjoy a day enjoying local markets, food or wine, or catching up with postcards. 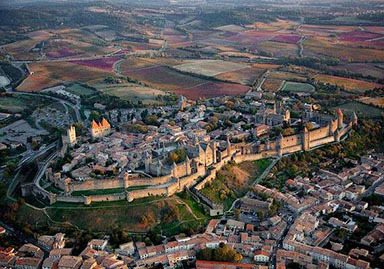 Transport is provided to Carcassonne, a world Heritage site, and the largest surviving medieval walled city in Europe. You can visit the city walls, the site of several sieges, and also the Basilica, where Saint Dominic preached and Simon de Montfort was originally buried, see where the Inquisition had their headquarters, and visit the Château Comtal, the Viscounts' castle within the Cité of Carcassonne. Day 6  Termes and Arques. We head through the Corbiéres to visit the castle at Termes, which was besieged for several months during the Albigensian Crusade and is one of the best attested sieges of the middle ages. Lunch is at a local restaurant. In the afternoon we will visit the castle at Arques, a spectacular donjon of the fourteenth century, built by the family of one of the crusade leaders. Day 7  Foix / Toulouse. In the morning we visit the castle of Foix, the capital of the medieval Counts of Foix, who were major players in the Cathar Wars, and the most able and accomplished commanders on the side of the Occitan forces. INCLUDED: tour transport, 6 lunches, 2 suppers, 6 hotel nights (days 1 to 6), all entry fees. EXCLUDED: Travel to and from the Languedoc; breakfasts, lunch on the free day, 4 suppers. Hotel nights for days 0 and 7. We will be staying at a hotel near Couiza - for the seven days (six nights) of the tour. The tour starts and ends in Toulouse. You are free to make your own arrangements to get to and from Toulouse but we can recommend the Hotel Raymond IV (three star) which is central, ideally placed for the tour, and only a short walk from the railway station in Toulouse. There are no age or health restrictions, but you should be aware that there is some uphill walking. The most demanding is Montsegur - about 40 minute uphill walk, but we go slowly and take several stops. A few people chose to skip this. Prices are revised each year. If you book and pay a deposit this year, the price is fixed at that rate for the following year. We aim to be as flexible as possible. Just let us know if you have any special requirements and we will try to accommodate them. Join one of our scheduled week-long tours which take place in May/June and September each year, including iconic sites such as Montsegur. Customised Tours for 1 person to 5 people: you get to chose how long the tour is, where you visit, and what topics you want to learn about. Customised Tours for groups of 6 or more: you get to chose how long the tour is, where you visit, what topics you want to learn about, and where you stay. Join one of our limited number of scheduled day-tours which take place in May/June and September each year, including iconic Cathar sites such as Montsegur. 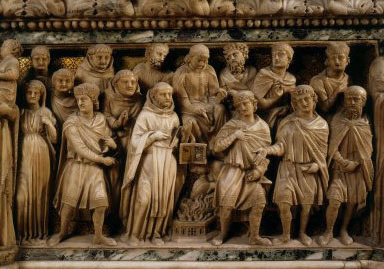 If you want an entertaining but intellectually rigorous and historically accurate account of Catharism, the Albigensian Crusade and the Medieval Languedoc..
We offer a Concierge service to help you plan tours focused on the Languedoc / Occitania (including topics other than the Cathars). 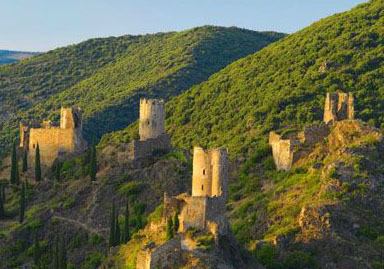 We also offer services to established Tour Operators organising visits to Cathar Country. © Cathar Castle Tours. All rights reserved.